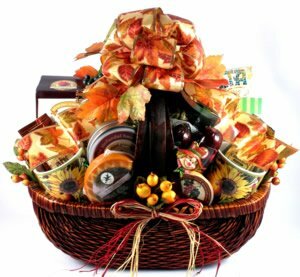 This attractive, handcrafted basket is piled high with a bountiful bonanza of savory gourmet favorites and beautiful gifts that they will truly love! That is, once they get past that "It's just to pretty to open!" moment that we keep hearing about. This gift includes two heavy ceramic coffee mugs with a beautiful Fall harvest graphic, Irish Cream and Colombia Supreme gourmet ground Coffee, a ceramic and stainless steel Fall Cheese Spreader, Smoked Gouda Cheese, Merlot Flavored Cheddar, Wisconsin Cranberry and Cheddar Cheese, All Beef Summer Sausage with Cranberries, Garlic Beef Summer Sausage, Wild Alaskan Smoked Salmon, a large assortment of Classic Entertainment Crackers, Parmesan Bruschetta Sourdough Crisps, Chardonnay Flavored Wine Biscuits, Smoked Almonds, Jumbo Cashews, fine French Truffles and Apple Spice Cookies all artfully arranged in one large and absolutely stunning basket! All this and life-like fall enhancements, silk ribbon and bows work together to create a gorgeous presentation and fantastic fall gift!